The Cisco Network Diagrams Solution from the Computer and Networks area of ConceptDraw Solution Park helps you to create the Cisco Network Diagrams quick and easy using the ConceptDraw DIAGRAM diagramming and vector drawing software. The Cisco Network Diagrams Solution contains 14 libraries with 450 ready-to-use predesigned vector objects. Open the libraries, simply drag-and-drop the needed objects into your document and connect them to quickly design your professional looking Cisco Network Diagrams. You can also create the Cisco Network Diagram in one moment using the predefined templates and samples from ConceptDraw STORE. 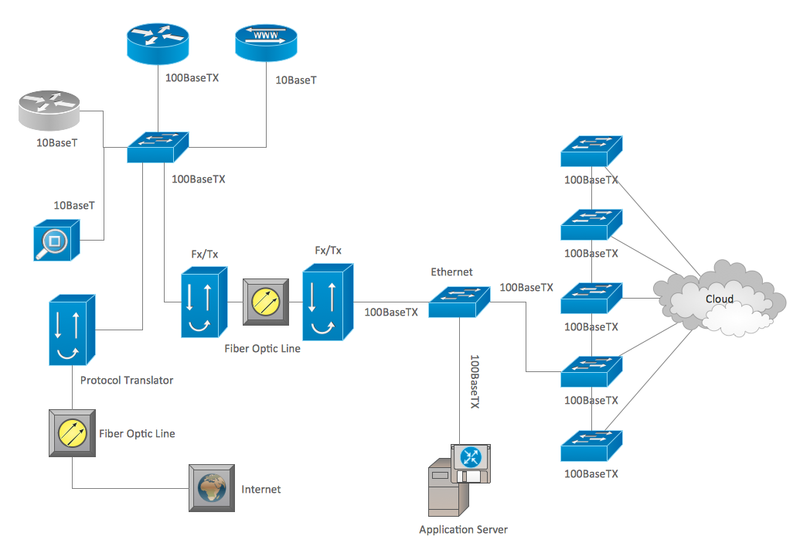 This Cisco Network Diagram was created in ConceptDraw DIAGRAM diagramming and vector drawing software using the Cisco Network Diagrams solution from ConceptDraw Solution Park. ConceptDraw DIAGRAM v12 is the best network diagram software. 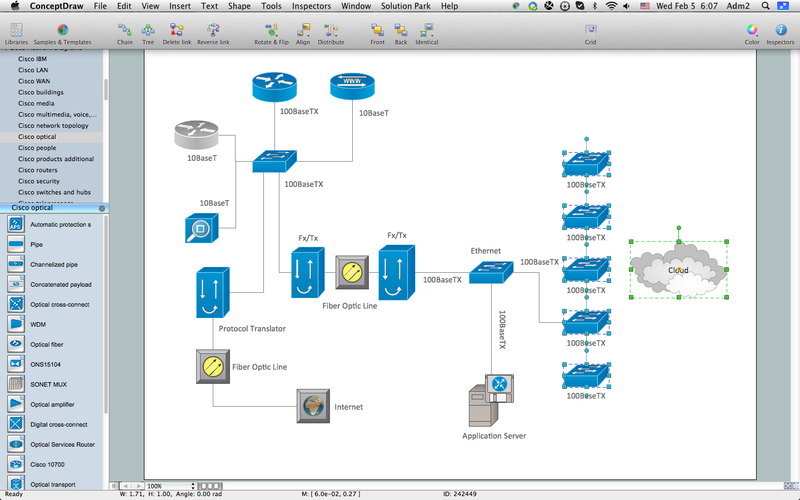 To design the Cisco Network Diagrams and visualize the computer networks topology use ConceptDraw DIAGRAM v12 diagramming and vector drawing software extended with Cisco Network Diagrams solution for ConceptDraw DIAGRAM v12 Solution Park. ConceptDraw DIAGRAM v12 diagramming and vector drawing software offers the Vehicular Networking Solution from the Computer and Networks Area of ConceptDraw Solution Park which makes it the best for designing professional looking vehicular network diagrams. 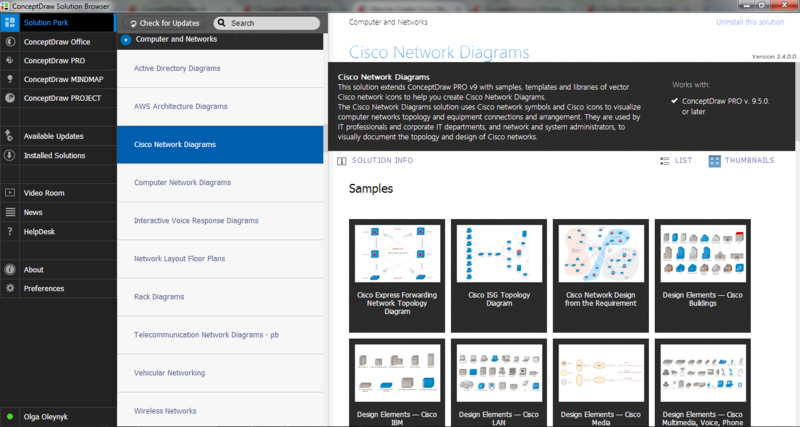 Draw Cisco Network Topology and Cisco Computer Network Diagrams, Designs, Schematics, and Network Maps using ConceptDraw in no Time! Cisco Network Diagrams solution also provides 15 libraries of 508 Cisco symbols for network components and points, LAN and WAN, schematic and wiring drawings. ConceptDraw Wireless Network solution includes 81 of professional-looking stencils and several samples that you can modify and make your own diagram. ConceptDraw DIAGRAM v12 is perfect for software designers and software developers who need to draw Network Active Directory Diagrams.